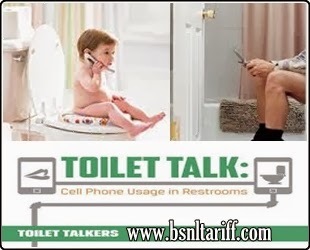 Home Mobiles-Tablets India To use Your Mobile in the Bathroom is it bad manners? To use Your Mobile in the Bathroom is it bad manners? Recently United States of America (U.S) based Organization conducted a survey revealed that maximum percent mobile users don’t maintain mobile manners. It is found that 43 per cent of mobile users pick up their mobile phone use to sent or receive text messages while in the bathroom, 21 per cent or received email and 22 per cent place or received ca call. Another 20 percent of respondents played games, 10 per cent listened to music and 6 per cent use for other searching for something while in the bathroom. 10 per cent Women are likely to have made voice calls and send received messages, about 12 per cent men are more likely to have used email and played a game and 16 per cent listen music on their mobile device. 45 to 55 per cent less likely Aged over 45 to have used the mobile device while in bathroom and 60 per cent more likely Aged 18 to 24 year olds uses mobiles in the bathroom, 1 per cent mobile uses likely to chat. If you really like this article don’t forget to subscribe to Join in Our Community. Post your views on Our Community desk to share with our other readers.